Summary: A photo collage or photo birthday card containing all past happy memories will make your loved ones move and smile. Especially when integrating music, video, sound and animations into the birthday card design, which make it really more vivid and lively. With so many social networking sites springing up, like the major social network – Facebook, sending birthday wishes online has become a much easier task. 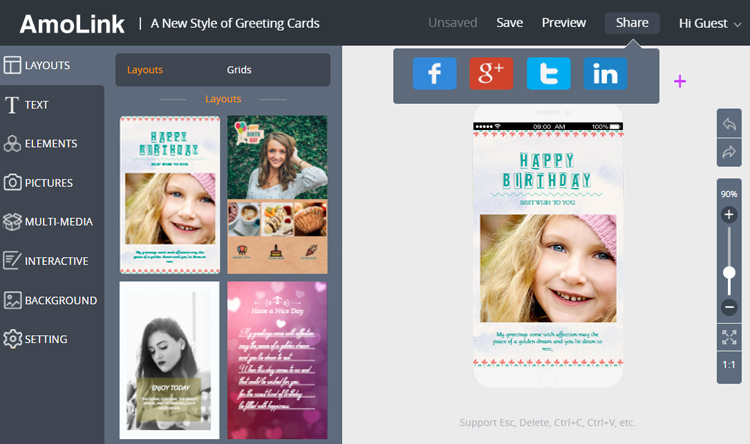 As well, various free websites and card makers allow you to personalize your birthday wishes by yourself. The resources are ample and all you have to do is explore the different ways to send birthday wishes over the Internet. You must also be accustomed with the technical aspects for coming up with creative birthday gift ideas to wish someone happy birthday online. A better choice for you is take help from numerous online applications to deliver birthday wishes. With every passing day, the number of friends on our social graphs increases, and our daily “birthday” list increases proportionally as well. Unfortunately, most time we may just post one sentence “Happy Birthday” on someone’s wall when we mean to show them more attention. Here I come up with a few interesting ways to better wish someone a happy birthday on Facebook. If you’re wishing happy birthday to someone you are familiar with, find a photo or photos of you two together and post it to their wall along with the “happy birthday” greeting, which will remind them of some good times and bring a smile to their face. I’ve found that posting interesting photos can trigger some reminiscing from other friends. Making videos by assembling the funny and warm moments that you have captured earlier is a great idea without any doubt. But this is not applicable for everyone. You can take help from YouTube and find out the funniest videos to post them on your friend's wall. Pick up some segments that are worth laughing at and then share the joy with your friends. If you want to be more creative, just make them a surprise birthday fan page! Create a private fan page and invite all of the person’s friends to join. Maybe name it “Happy Birthday” or “Person is the Best!”. Once completing it, unveil the page on their birthday and surprise them! What’s more, you can ask people who join the fan page to leave a little message about a fun story between them and the birthday person. It’s not only fun but also bring joy to the circle of friends. There’s no doubt that in today’s Facebook world, it’s not practical to read every Birthday note on your wall. If the person is special and important for you, you can shoot them a private message to say Happy Birthday with some thoughtful words. Sometimes the public happy birthday can’t really express how you feel about someone, because it’s too public. If the person who you are wishing is very close to you, then this simple Facebook post will not fully express your birthday wishes. In this case you can collect some of the glorious pictures of the person and make a great collage of all the pictures and this collage should be posted along with the post. There are many sites that allow you to make a photo collage online. You can take help from these sites and follow the guidelines to make a birthday album. Such as AmoLink – a easy-to-use and free online birthday card maker both go for web and mobile, here you can upload your photos in Facebook, Instagram, mobile phones, computers or other devices, change color, text, add voice, music, video, funny decorations and dynamic effects. Especially it has a new function – Grids, it has a lot of layout styles in Grids, you can make full use of it to make your photo birthday cards more beautiful and attractive. To make it humorous, pick up those photos containing funny poses and twisted faces. Then add some funny captions and notes to each picture and post it on his/her wall. This beautiful happy birthday card along with all creative photos on the wall will make the person realize that he/she is very special for the respective person. Make the birthday person feel that your friendship has not at all turned old but growing stronger and stronger by the time. Making free photo birthday cards that are full of warm and move memories between you and your loved ones is really a good happy birthday idea. There are a lot of free websites for you to make and send birthday card online. But that is not enough, in such a mobile area, some websites have started to provide mobile greeting cards service for their users, which means people can make and send birthday cards or other greeting cards on mobile and the recipients can directly and handy view your birthday wishes in mobile phone. In AmoLink, you can free to choose various birthday card layouts you fond, as well you can completely make your own layout as you like, AmoLink provides pictures, elements, animations and etc. for you to be your own designer. 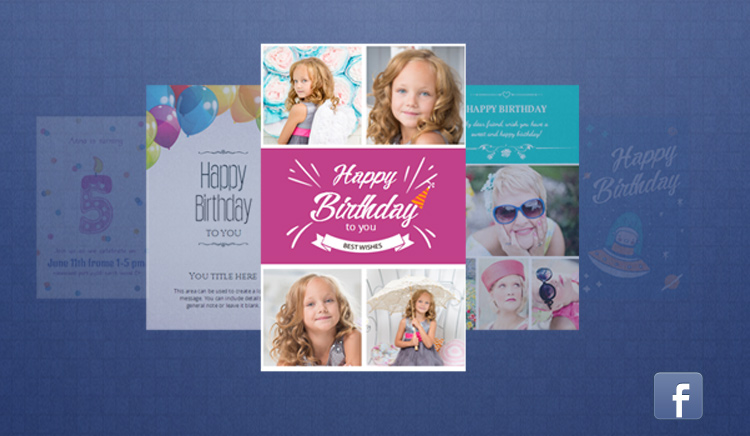 We not only offer layout but also provide free birthday card template for you to make a vivid and warm birthday card integrating with music, video, record and animations, which will really wow your friends on Facebook. In the birthday card template, you just need to replace the photos for your own, then you can change the texts, write your thoughtful birthday wishes, add voice, music, video or animations, even do some decorations for your birthday card design, just do all you want for this photo birthday card to express your love to your friends. After finishing birthday card designs, you can directly post your special birthday greetings on Facebook through AmoLink, just click the share button and then post it on your Facebook. As well, you can directly share your happy birthday greetings on your friend’s timeline. Additionally, you can text a message or post to social networks, you just need to include a link in it, he or she will browse your birthday wishes in a thunder speed. What are you waiting for? Just make your loved ones special day more memorable now with AmoLink!